The first part of this article may seem a bit technical, but that’s only to provide a context for introducing you to some of the most fantastic and intriguing creatures on the planet. So, please, plow through and, I think, you’ll find it worthwhile. I’ll provide a bit of an incentive; at the end, you’ll find a glorious visual experience, but please don’t cheat and jump to the end; you’ll just spoil the surprise for yourself. Yep, there are some sponges with tails and I’ve already written a bit about one and you can find the article here. 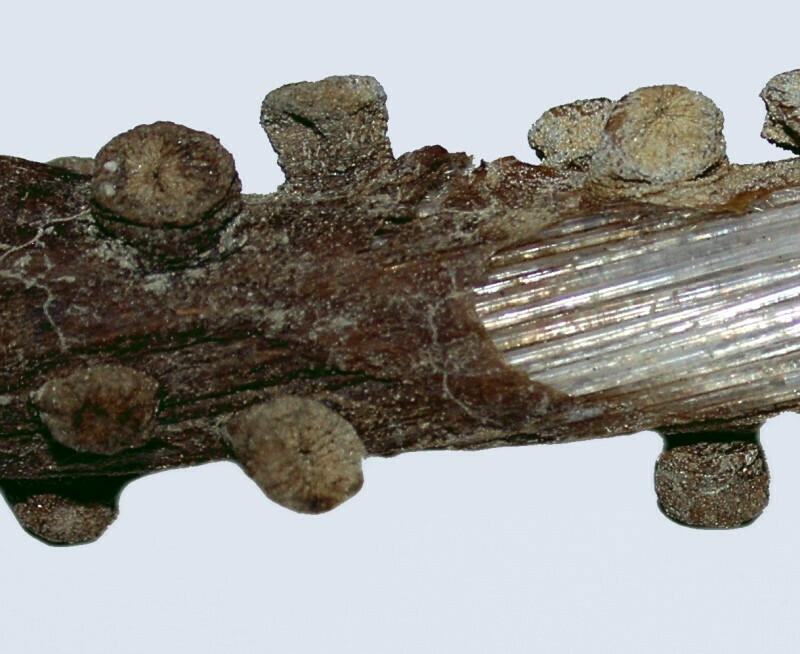 However, since then, I have acquired a couple of sections of the long glass (silica) tails with parts of them covered by a “sheath” and there are “bumps” or nodules on the sheath. At first, I thought the sheath was simply an accumulation of detritus from the substrate, but later examination proved otherwise. 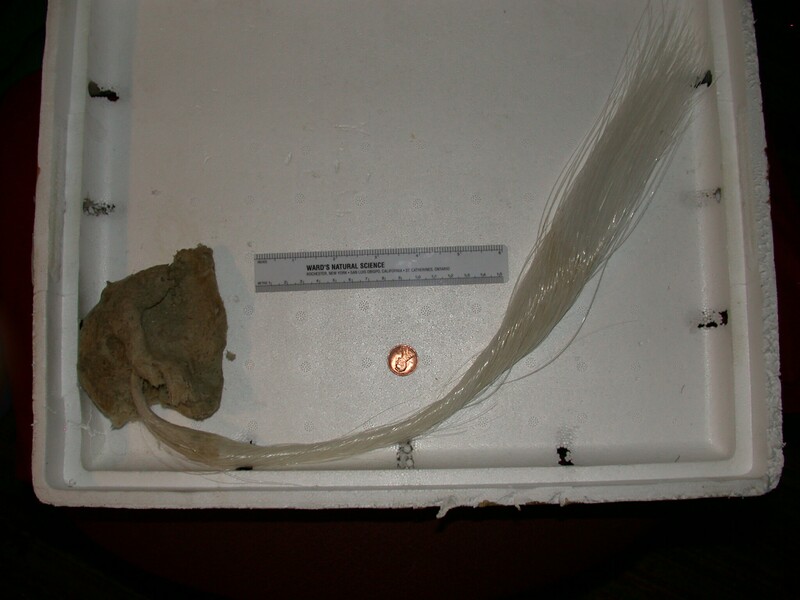 These sponges have bundles of fibers which they use to anchor themselves in the substrate and the ones which we will consider primarily are members of the genus Hyalonema. However, there is another glass sponge with a set of amazing characteristics and there has been some confusion about whether or not it belongs to this genus. Taxonomists began wrestling with classifying these extraordinary creatures back in the 19th Century. Some of the more striking examples also earned popular names, such as the Venus Flower Basket and the Glass Rope Sponge. It is this latter one that we shall be concerned with. There is a classic illustration of this species which is often printed. Here is the print. 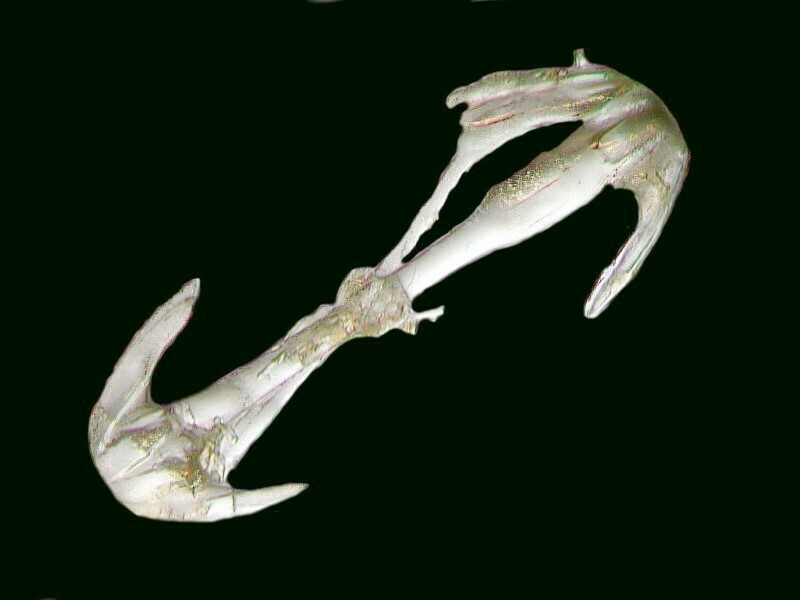 Most accounts refer to this as a specimen belonging to the genus Hyalonema, but there are a few which label it as belonging to the genus Monorhaphis. This may seem like a small matter but, in fact, it makes a very significant difference as we shall see. There are many species of Hyalonema, but only one of Monorhaphis, namely, M. chuni. 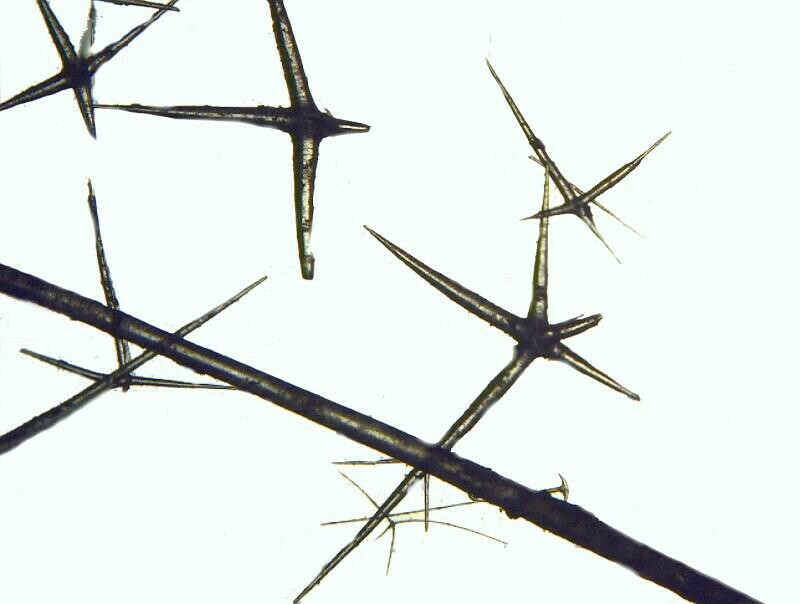 “Mono” meaning “one”, “rhaphis” meaning one of a bundle of needle-like crystals, so the very name is telling us that the anchoring spicule in this genus is singular, i.e., there is only one. In Hyalonema however, we find a bundle with many spicules rather like long threads. Now, if we go back up and look at the illustration above, we will notice that there are indeed multiple fibers, not just one. 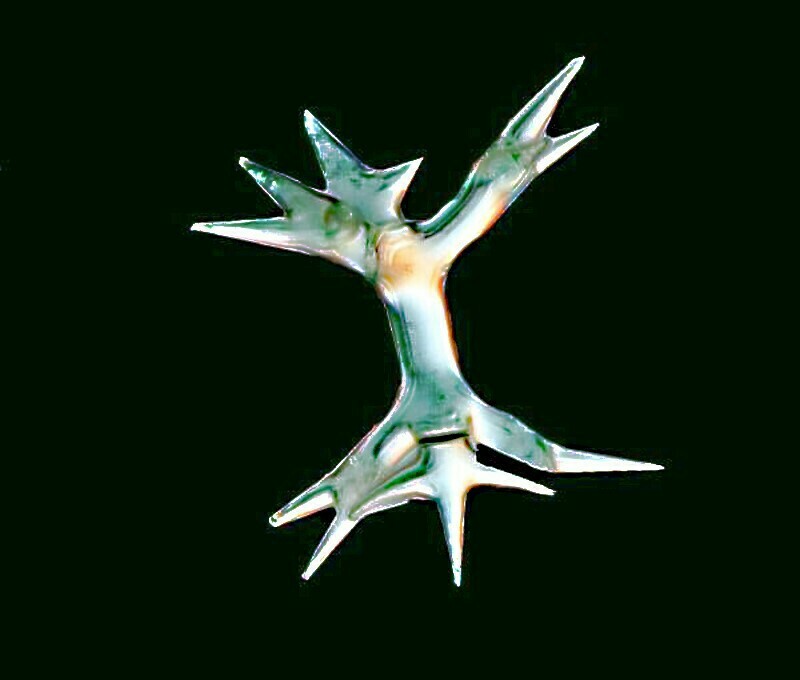 However, a distinctive and distinguishing characteristic of Monorhaphis chuni is that not only does it have just one, but a specimen which researchers have been examining at the Max Planck Institute in Potsdam–Golm has an anchoring spicule which is approximately 12 mm in diameter and about 10 feet long!!! This led the investigators to subject samples to examination using ultra-high tech equipment to try to discover how the silica is deposited and how long it would take to produce a structure of such length. The conclusion is astonishing: It is estimated that the age of this creature is 11,000 years plus or minus 3,000!!! It is not a fossil, but was a very old living colonial creature. Here is an image of the spicule. 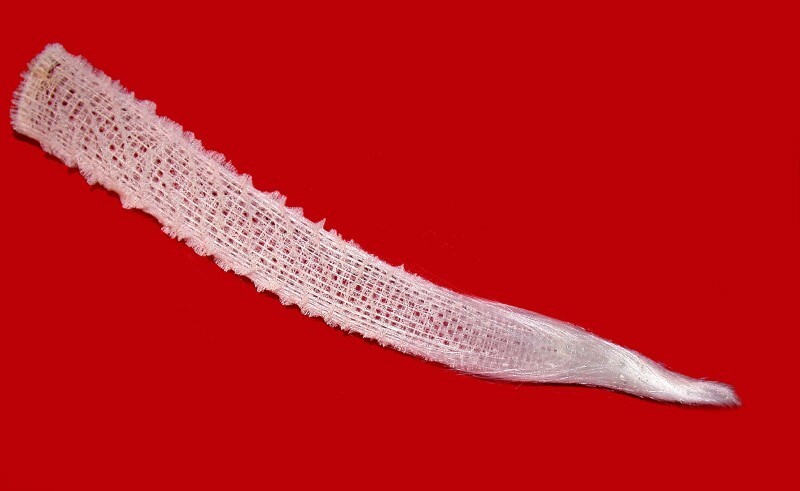 An image of the entire sponge is more difficult to produce, since several of the ones attributed as Monorhaphis are Hyalonema. Here, for example, an image which purports to be Monorhaphis has multiple anchor spicules. However, this image, does indeed seem genuinely to be Monorhaphis. Glass sponges are mostly deep-sea creatures and therefore difficult to study; indeed, difficult even to discover. In the relatively recent past, a number of striking specimens have been discovered off Antarctica and others in the Marianas Trench (the deepest spot in the ocean). Here is a short video clip which will show you a sampling of these incredible creatures. So, let’s return to Hyalonema. First, I’ll show you a couple of images of the entire sponge. Next, I’ll show you some aspects of the ones with sheaths over parts of the “tail” and we’ll consider some interesting puzzles. 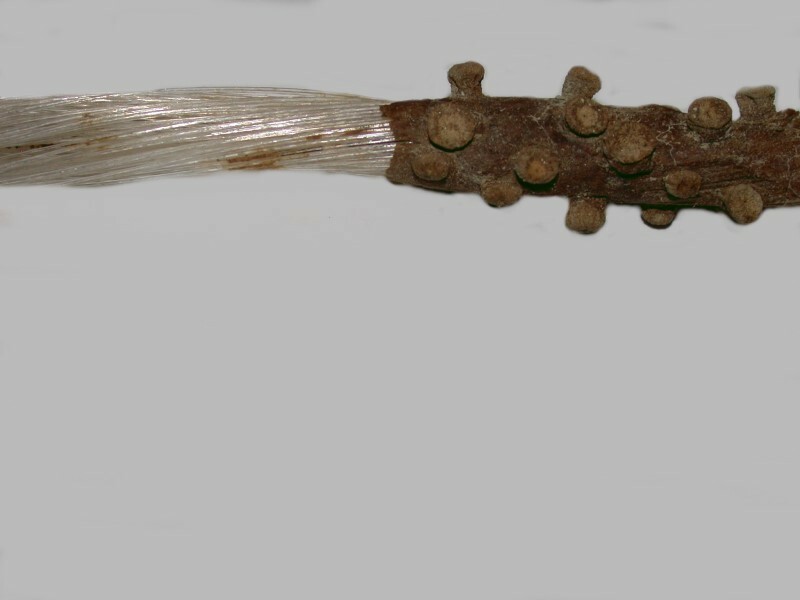 Notice that in the first image, the sheath is rather like insulation around the wire in an extension cord and the glass fibers are like the wires. However, in addition, we have here some strange bumps or nodules along the surface of the sheath. At first, these were a complete mystery to me and we’ll come back to them in a couple of minutes. First, I want to say a few words about spicules and talk for a bit about how to handle glass sponges if you are going to handle them at all. Spicules are the elements which constitute the “skeleton” of a sponge. These can be calcareous or siliceous and we shall be concerned here only with the latter. The glass sponges are classified as hexactinellids, that is, they can have spicules that possess six “spines”, “needles”, or “rods”, but they can also have spicules which have fewer and can be morphologically highly unusual. In some sponges, the spicules are highly fused and occur in distinctive patterns as is the case with Euplectella (the Venus Flower Basket). In others and Hyalonema is such a case, the spicules seem to be arranged in a quite random fashion and have a rather extensive variety of shapes and sizes. I’ll show you 3 very different types of Hyalonema spicules all taken from the same specimen. If you wish to investigate glass sponges yourself, there are some basic precautions which you should take. Remember these skeletons are glass. As one mashes up bits to view the spicules, you are creating fine powder of ground glass and the long tail spicules can be very sharp when broken. If you value your eyes, then it is imperative that you wear goggles even though they may be rather uncomfortable and seem rather cumbersome. A face mask is also important so that you do not get glass particles in your lungs. You should also wear rubber gloves to keep the particles from embedding themselves in your skin which will also help in discouraging you from rubbing your eyes. If all of this seems overly complicated, just ask yourself how much your eyes are worth. The procedure which I use is to have a long lab session in which I prepare (wearing the protections) as much material from the sponges as I think I will be using for the investigations which I wish to make. I then store that material in jars and vials. When I am ready to use it, I use forceps to transfer small amounts to a Petri dish in which there is distilled water. Now, the glass material is underwater and I don’t have to be concerned about it floating around in the air (and so there is not a need for the protective garb). 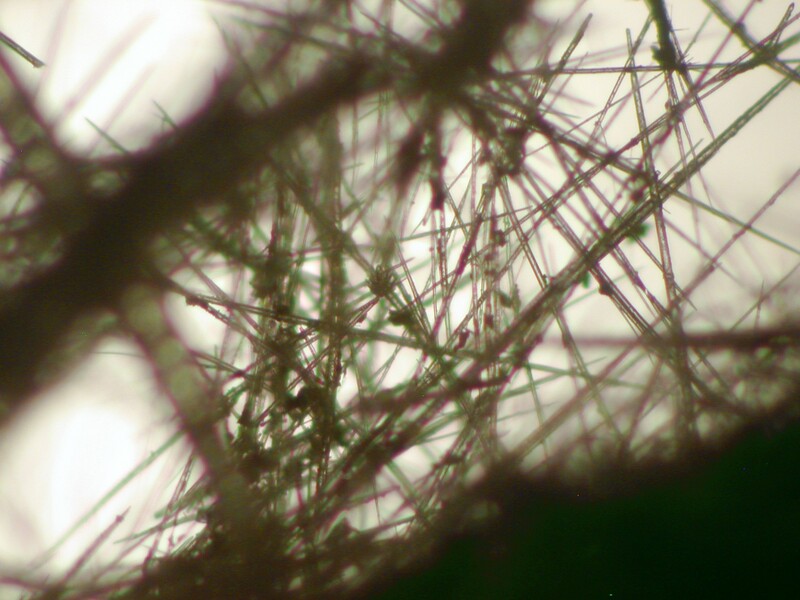 Recent highly technical research suggests that a layer of collagen is deposited around the glass fibers. 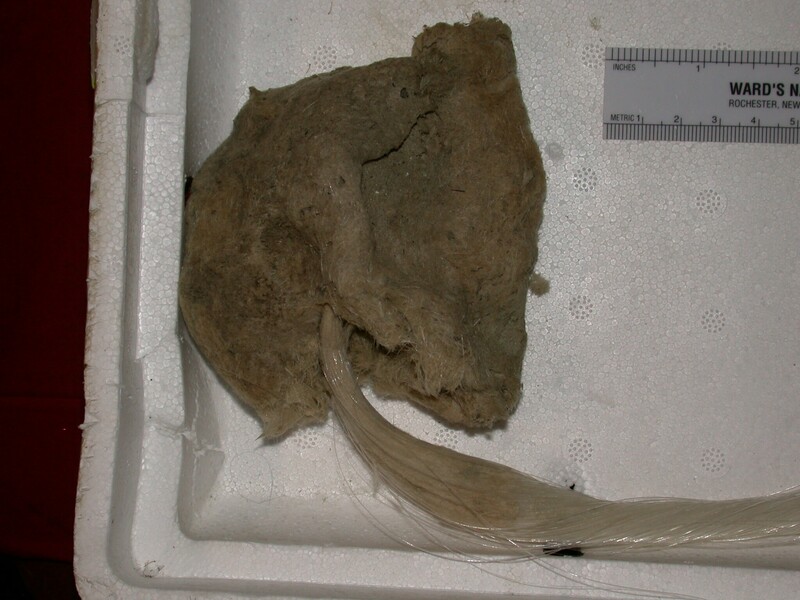 However, that is not much help to us in terms of what we observe in our specimens. Let’s take another look. For me, with my lo-tech approaches, the only satisfactory way of proceeding is to take a sample of first, the sheath itself, and then secondly, the nodules, and treat them chemically to see what I can discover. I treated a very small section of the sheath with sodium hypochlorite (household bleach) to dissolve out the tissue and see if there were any spicules and if so, what sort. 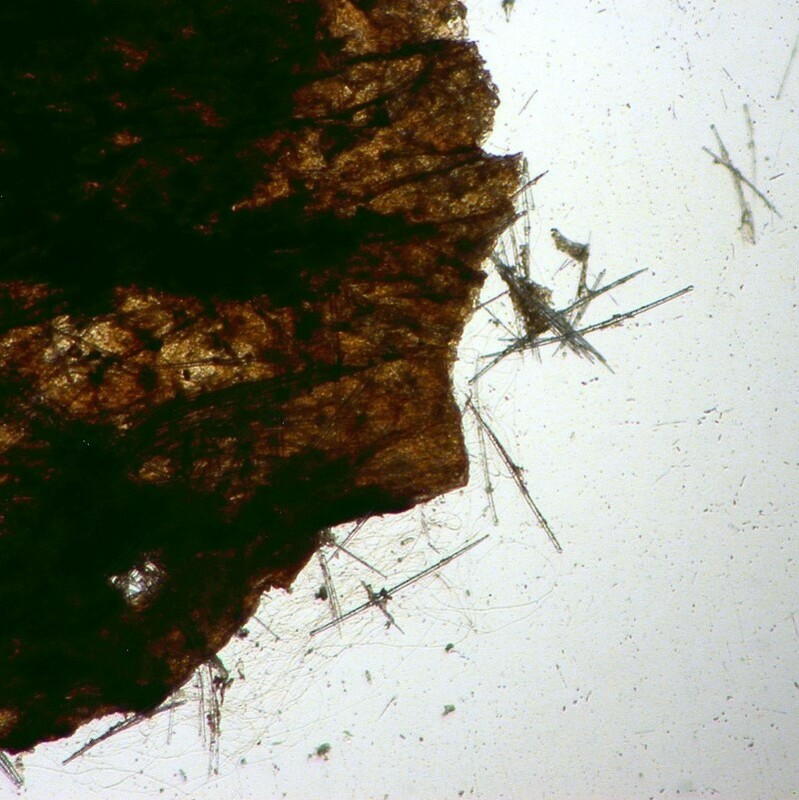 I treated another small section with hydrochloric acid to see if any spicules dissolved (and were thus likely calcareous) or whether they remained unscathed and thus were likely siliceous. After treating with sodium hypochlorite, it was clear that there were indeed spicules and, in abundance, as you can see below. Treatment with hydrochloric acid did not dissolve the spicules which were virtually all monaxons and thus most probably silica. 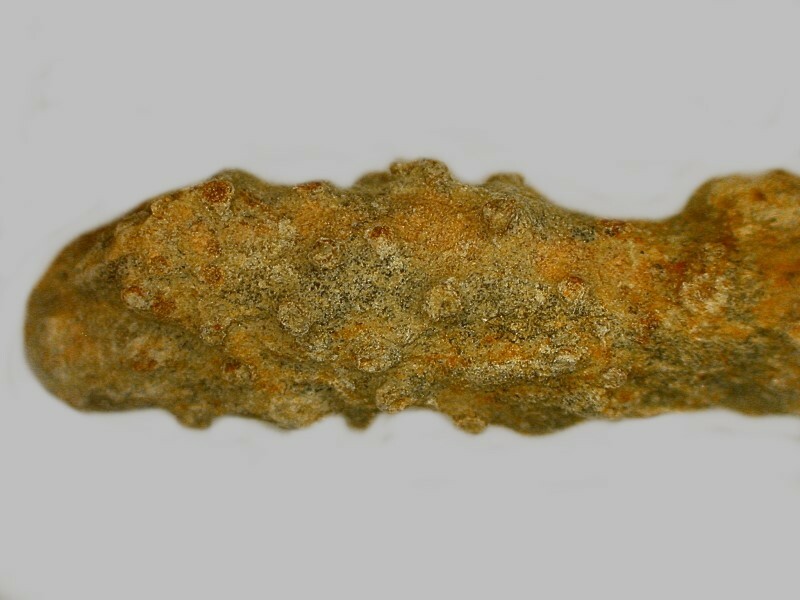 As I continued to look at the nodules, I kept asking myself what they reminded me of and then I remembered a small piece of fossil coral which I had in a nearby drawer. I also did some additional searching of the literature and found a 19th Century drawing which had a label pointing to a nodule which re-enforced my guess, namely, Zoanthium. There are still lots of little puzzles to be investigated regarding this extraordinary glass sponge and I hope to find time to do so. 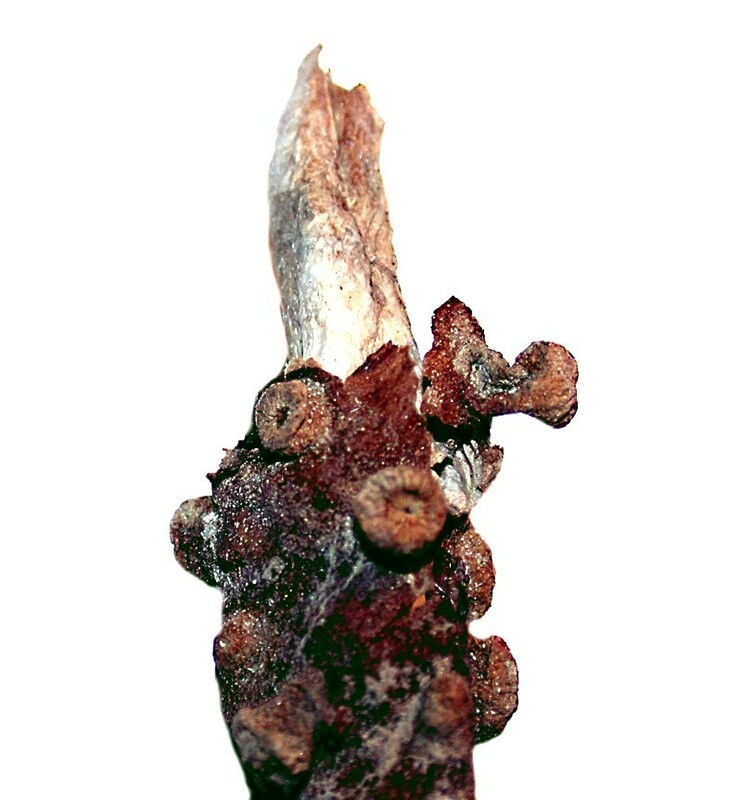 However, at the beginning of this essay, I promised you a treat and now I’ll show you what those brown, drab nodules look like when they’re alive. If you’re not already familiar with Zoanthium or the so-called “button corals”, prepare yourself for some of the most vividly beautiful organisms on this planet. If you encounter any, treat them with respect, not only because of their beauty, but they can also be quite toxic. Enjoy. Published in the September 2017 edition of Micscape Magazine.